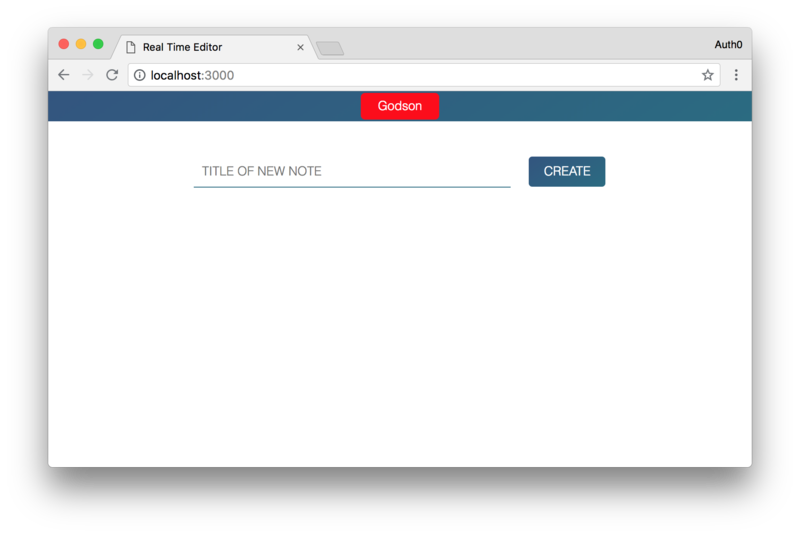 Learn how to develop a real-time web app that enables multiple users to work on the same document with ease. TL;DR: In this article, you will learn how to build a real-time, collaborative note editor application that enables multiple users to work on the same document simultaneously. To create this app, you will use tools like Node.js, Express, Pusher, and Auth0. If needed, you can find the code of the final app in this GitHub repository. "Building real-time, collaborative apps is easy with the right tools." As you can guess by the title of the article, you are going to build a real-time, web editor that enables different users to work on the same document from different places collaboratively. That is, you and one or more friends (for example) will be able to type and edit the same document at the same time. Just like if you were editing a Google Docs word but built by yourself. How cool is that? Express: a fast and minimalist web framework for Node.js. Pusher: a hosted service that helps you build real-time apps with less code. Auth0: a universal authentication & authorization platform for web, mobile, and legacy applications. Will you have to pay for these services and tools? No, you won't. Node.js and Express are open-source projects that you can use for free to build whatever you want to build. Pusher and Auth0 do have paid tiers where you can use advanced features to build better apps, but they also include some cool free tiers. You will be able to build amazing apps in no time with these services without paying a dime for quite a while. Unless your app becomes too popular, but that's hardly a problem, right? 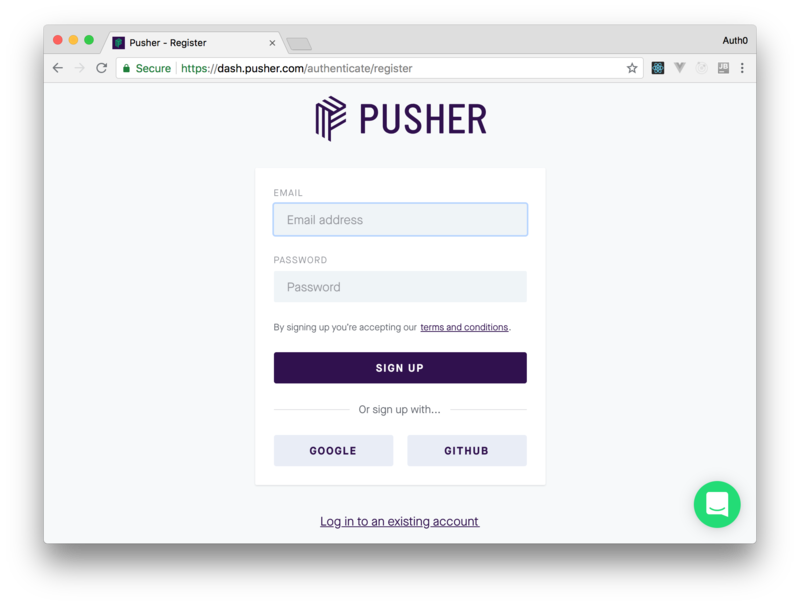 Pusher is a hosted service that makes it very easy to add real-time functionality to a web or mobile application. This service provides libraries that help to seamlessly build chat applications, real-time charts, collaborative editors, etc. You can find more information about Pusher and the features it provides on their website. In this article, you will use a feature provided by Pusher called TextSync to build your application. Basically, TextSync provides the functionality that enables users to work on a document in real-time with others. Besides that, it will also handle authorization and a few other things you will see as you build your application. Note: If you don't know why you are going to use .pug files, don't worry. Pug is a template engine for Node.js that facilitates the process of writing HTML files. Using Pug is really easy, as you will see. You will use the passport and passport-auth0 packages to implement user authentication with Auth0. You will use textsync-server-node to handle the Pusher TextSync authorization. You will use dotenv to load environment variables from the variables.env file into Node.js's process.env object. You will use pug for your server-side templates. Don't worry if all these don't make that much sense now. As you go through the article, you will learn how to use them. As mentioned earlier, you will use a feature from Pusher called TextSync to support the real-time characteristics of your application. As such, you will need a Pusher account to keep building your app. So, head to TextSync's webpage and sign up for a new account. After signing up, you can head to the TextSync section of your new Pusher account and hit the Create button. Hitting this button will make Pusher show a dialog where it will ask you for a name for your new TextSync instance. In this dialog, you can input something like "Collaborative Real-Time Editor" and hit the Create button. Pusher will take less than a second to create the new instance for you and, after doing so, will redirect you to a page where it will show some instructions on how you can use this instance. Although these instructions are useful, right now, you are not interested in them. What you are interested in is the box called Credentials in this page. This box will have two keys that you will have to use soon: Instance Locator and Secret Key. So, before heading back to your code, find this box and leave the page open. Next up, you will create your server-side templates with Pug. Pug provides a lot of features that you won't explore in this article. So, if you need more information about these features, you can find them here. This is what a Pug file looks like. If this is not clear enough, here it goes a better explanation of what Pug does with this file. and transform body.main into <body class="main"></body> and insert inside <html></html>. Note: Have you seen the extends layout line in this file? This is telling Pug that this view is using (or extending) the layout.pug template you created before. Also, block content in this file is telling Pug that the children of this element will go inside the block content element of the template. What is important in the index.pug file is that it contains a variable called slug that holds a random, alphanumeric string. When the form created by this view is submitted, the slug is sent to the server-side. Then, in your server, you will use it to create a unique link (URL) that other users will refer to when they join an ongoing session. This may not be very clear now but, soon enough, you will get the idea. app.js: A file that you will create soon to control the logic of this view. A div element with the sidebar class: This is where users will see who else is online with them. A div element with the main_content class: This is where you will add the editor (i.e., in the #text_editor element). instanceLocator: "YOUR PUSHER INSTANCE LOCATOR"
Note: In the code above, you will have to replace the value passed to the instanceLocator property with the one you have in your Pusher dashboard. 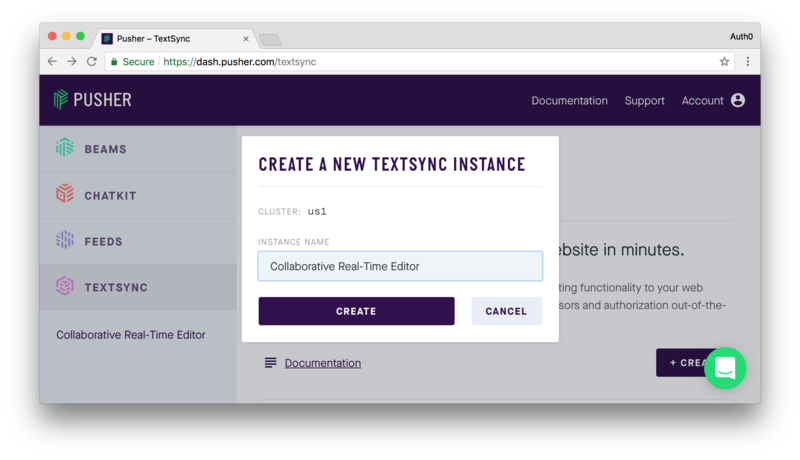 The call to the TextSync function will use this value to connect and interact with the TextSync instance you created on Pusher. docId: This is the ID of the document that will be loaded into the editor on creation. Previously, you created a slug which you used to create a unique URL. The function document.URL.slice(document.URL.lastIndexOf("/") + 1) gets the part of the URL after the last slash (e.g., from the URL localhost:3000/note/yajdzfr2w78, it extracts yajdzfr2w78) and that gets loaded as the docId into the editor on creation. This is important because the docId enables other users to join the same editing session. Essentially, all TextSync editors with the same docId belong to the same editing session. element: This is the DOM element that will contain the text editor. This may be either a CSS selector or a reference to the element object. authEndpoint: This is the URL of the endpoint on your server where the TextSync library can obtain authorization tokens. You will see exactly how this works later on. userName: The name of the current user to be displayed to other collaborators working in the same editing session. onCollaboratorsJoined: This function is called whenever a user joins this editing session. You will use this function to add the new user to the list of active users and update the UI accordingly. onCollaboratorsLeft: This function is called whenever a user leaves the editing session. You will use this function to remove a user from the list of active users and update the UI accordingly. For a broader list of the configuration properties, visit the official TextSync docs. Note: You will have to replace <YOUR_INSTANCE_LOCATOR> and <YOUR_SECRET_KEY> with the values that Pusher presented for your TextSync instance. After that, you will have to create a file called server.js in the project root. This file will contain your server's code. As the file will be a bit long, you will go through it step by step for easier comprehension. Note how, after requiring all the libraries you installed, you make Node.js load the properties from the variables.env file. You will use these variables soon. Also, note that you make your Express instance (i.e., app) use (or understand) the Pug view engine. With that in place, you make an Express app be able to serve Pug views. express.static: This middleware makes your Express app serve files under the assets directory as static files (i.e., it makes your Express app simply return their values without any modification when requested). bodyParser.urlencoded: This makes your Express app parse urlencoded bodies. bodyParser.json: This makes your Express app parse JSON bodies. session: This middleware makes your Express app provide a session to your users (for a production-ready app, you will want to change the value passed to secret). /: This route makes your server render the index.pug file (res.render('index', ...)) with the logged in user (req.session.user). As you remember, the index.pug file is a view that renders a form so users can create new editing sessions. /note: When the form in index.pug is submitted, a POST request is made to this route, which sends along the slug. This route retrieves this value from req.body.slug and uses it to create a new, unique route. The user is then redirected to this new route. /note/:slug: This is the new route created and also where the collaboration takes place. The :slug in this route represents the unique slug defined previously. This route is unique to each editing session, and anyone invited to join a particular session does so through this route. Remember that, while configuring the TextSync editor, you added a property called authEndpoint to handle TextSync authorization? What this means is that any user that intends to join an editing session must be authorized through this endpoint. But how? When a user tries to join an editing session, a POST request is made to this endpoint. The server (yours) then responds with a secure token describing the rights and permissions that the user has in relation to the document they are trying to access. The TextSync library then sends this token along when making a request to the TextSync server (Pusher's) and, if all goes well, the user is allowed to access the document with the appropriate rights and permissions exclusive to that user. As you can see, the first change you made to your server is related to creating a textSync object with your environment keys. This is the object that you will use to communicate with your TextSync instance at Pusher. After that, you defined the /textsync/tokens endpoint so your frontend app can issue the POST requests, as previously configured. What is interesting about this endpoint is that it defines a function called permissionsFn to define what type of access users will have. For the sake of simplicity, you defined that all users will have the READ and WRITE permissions. However, if you are going to keep enhancing your app after you finish this article, you will probably want to add some logic in this specific function to be more restrictive somehow. Lastly, you made the new endpoint call authorizeDocument to generate a new token to your user so the can join the editing session. This token is then sent back as a response to the POST request submitted by the frontend app. So far, you haven't actually secured your application. In the previous section, you did add an endpoint that handles authorization, but authentication is something different. Authenticating users means recognizing them, authorizing users means allowing them to do stuff. 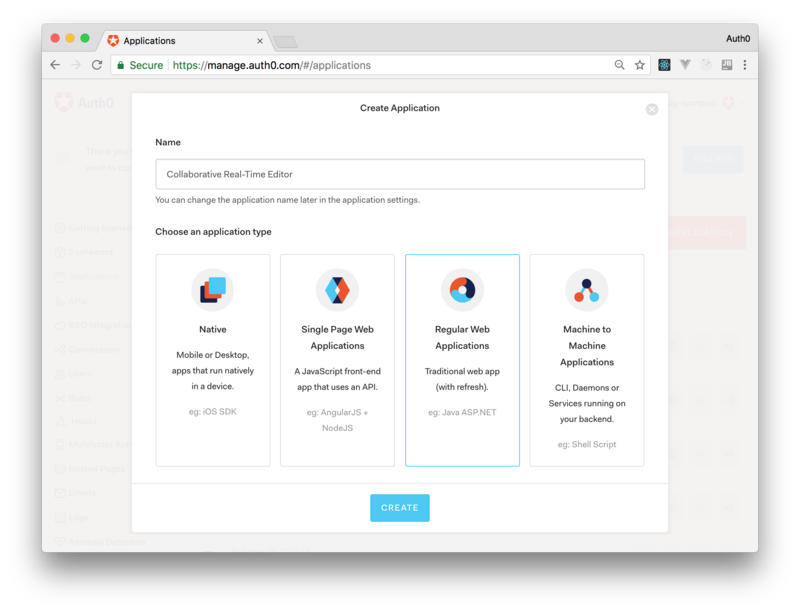 So, in other words, what you did so far is to simply add an endpoint that allows any visitor to join any editing session in your app. As such, now, you will have to handle authentication and, for that, you will use Auth0. The Name of your application: Here, you can add any descriptive name. 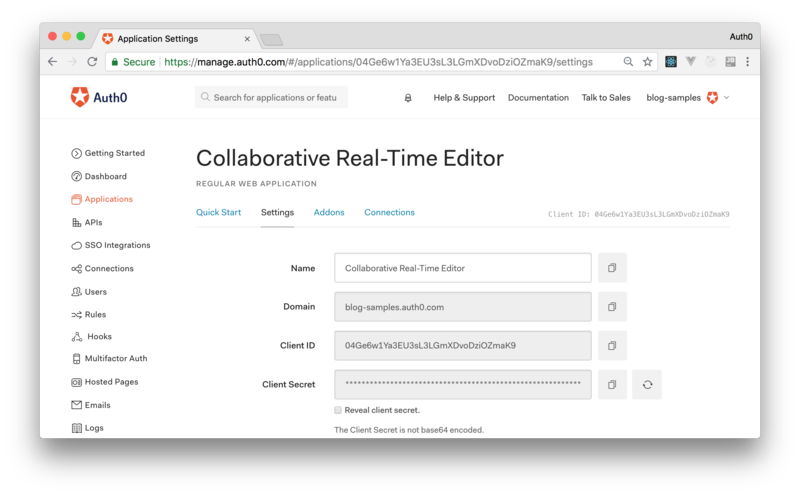 For example: "Collaborative Real-Time Editor". The Application Type: For this, you will have to choose Regular Web Applications. After informing these values to Auth0, you can hit the Create button. Clicking on it will make Auth0 redirect you to the Quick Start section of your new application. From there, you can head to the Settings tab, where you will configure your app. Now that you are on the Settings tab, search for a field called Allowed Callback URLs. In this field, add http://localhost:3000/callback. In case you are wondering, what this field does is to add an extra layer of security by telling Auth0 that the only URL allowed to be called back after authentication is the ones you input there. When releasing your app to the world, you will have to change from localhost to your public domain. But that is not the case here. Note: You will have to replace <YOUR-CLIENT-ID>, <YOUR-DOMAIN>, and <YOUR-CLIENT-SECRET> with the values that Auth0 shows for the application you created there. That is, you will have to replace these placeholders with Client ID, Domain, and Client Secret respectively. /login: When users hit this endpoint, your server will redirect them to the Auth0 Login Page, so they can log in. /callback: After these users authenticate on Auth0, they get redirected to this endpoint (i.e., to http://localhost:3000/callback). So, in this endpoint, you finish the integration with Auth0 by passing the request through Passport (passport.authenticate) and by setting the user session (req.session.user). Lastly, you start your Express server by making it listen to port 3000. Then, open http://localhost:3000/ in a web browser. There, you will see that you get redirected to Auth0 so you can log in and, after logging in, you will see a screen where you can start an editing session. Now, if you a define a title for your editing session and hit the create button, you will be redirected to the screen where you can start editing the new document. Wondering how the collaborative editing works? Copy the unique URL you got and open on another browser. Then, after authenticating, paste the URL again (this time you will have an active session) and you will be able to see that two users are on the current editing session. Cool, isn't it? "I just built real-time, collaborative web editor. So awesome and so easy!" In this article, you learned how to create a collaborative, real-time editor where different users can work on the same document at the same time. To do so, you used tools like Node.js, Express, Pusher, and Auth0. Although the example is simple and it does not persist the edited content on databases, it was enough to give you a pretty solid foundation to build production-ready and secure applications that have real-time capabilities. What do you think? Did you enjoy using this tools? Let me know in the comments box below!